Eugène Marais was born in a farming community near Pretoria in 1872. Journalism was his first career, but he later studied law in London, and by 1910 was in Johannesburg trying to establish himself as an advocate. Increasing depression drove him to retreat to Waterberg, a mountain fastness in northern Transvaal. Settling near a large group of chacma baboons, he became the first man to conduct a prolonged study of primates in the wild. It was this period that produced My Friends the Baboons and provided the major inspiration for The Soul of the Ape. He returned to Pretoria to practise law, to resume his career as a journalist, to continue his animal studies and to write poetry in Afrikaans. In 1926, the year after he had published a definitive article on his original research and conclusions about the white ant, a world-famous European author took half Marais's life-work and published it as his own. This plagiarizing may well have been a major factor in Marais's final collapse. Plagued for many years by ill-health and an addiction to morphine, he took his own life in March 1936. 4. What is the Psyche? THE name of Eugène N. Marais is known to all Afrikaans-speaking South Africans as a writer of short stories and verse. He himself, however, would wish to be remembered for his lifelong study of termites and apes. He began life after leaving college as a journalist, then studied medicine for four years, but eventually took up law and was called to the bar by the Inner Temple. A scholar and a man of culture, he chose nevertheless to live for a period extending over many years in a 'rondhavel' or hut in the lonely Waterberg mountains, learning to know and make friends with a troop of wild baboons, whose behaviour he wished to study. He tamed them to such a degree that he could move among them and handle them with impunity. At the same time he busied himself with the other end of the chain and studied termite life, a study which often meant tremendous drudgery and needed endless patience. During those years Eugène Marais was not concerned with publicity in any form, but a friend induced him to write an article for an Afrikaans periodical called Die Huisgenoot. This proved so popular that the author was besieged for more, and the articles continued for almost two years. 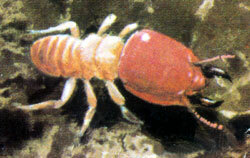 His years of unceasing work on the veld led Eugène Marais to formulate his theory that the individual nest of the termites is similar in every respect to the organism of an animal, workers and soldiers resembling red and white blood corpuscles, the fungus gardens the digestive organs, the queen functioning as the brain, and the sexual flight being in every aspect analogous to the escape of spermatozoa and ova. About six years after these articles appeared, Maurice Maeterlinck published his book, The Life of the White Ant, in which he describes this organic unity of the termitary and compares it with the human body. This theory aroused great interest at the time and was generally accepted as an original one formulated by Maeterlinck. The fact that an unknown South African observer had developed the theory after many years of indefatigable labour was not generally known in Europe. Excerpts from Marais's articles had, however, appeared in both the Belgian and the French press at the time of their publication in South Africa. Indeed, the original Afrikaans articles would have been intelligible to any Fleming, for Afrikaans and Flemish are very similar. No one who reads this book, based on the articles published so many years earlier than Maeterlinck's book, would hesitate to give its author the honour due to him. Eugène Marais intended writing a fuller and more scientific volume, but this intention was frustrated by his untimely death a few months ago. EUGÈNE Marais was a South African poet, a story-teller, a journalist, a lawyer, a psychologist, a natural scientist, a drug-addict, and a great genius -- an abused and forgotten genius, and the world is the worse off for that. He was master of a science that was only invented 50 years later (ethology); it was 60 years before anyone else attempted to study what he'd studied (ape societies in the wild); he described natural mechanisms and systems that were not identified by mainstream science until 40 years later (pheromones); and neither science nor society has yet caught up with many of his findings and conclusions. As a boy growing up in Cape Town in the 1950s I knew of him as an Afrikaans poet, an early champion of the language of the Boers. We studied his poem Winternag (Winter's Night) in school, and duly thought nothing of it. He could have taught us so much more, if they'd let him. Like many of us, I always had animals or birds or creatures of some kind around, or in my pocket or hanging off my clothes -- and so did Marais. His son wrote of him: "[He] was never without tame apes, snakes, scorpions, and the like." At one time I became fascinated by ants, and spent ages lying on my stomach on the ground studying them. "What are you doing?" my mother asked once. "Counting ants," I told her. It became a family joke. If only I'd known what Marais had to say about ants! It was only much later that I really discovered Marais, and I guess most of us still haven't. Which is rather typical of Marais, and that's a tragedy -- which is also typical of him. As a scientist it was the mind of man, the human psyche, that preoccupied Marais, and to find the key to its nature it was to nature that he turned, rather than to humans. He followed two parallel paths, the study of the animals most like humans, the primates, and the study of creatures that could hardly be more alien to us, the social insects -- termites, known in his day as white ants. In both fields his findings were revolutionary. In a way Marais was lucky. For entirely unrelated reasons he stumbled upon unique opportunities for his research. One reason for his success was that nobody else had had the chance to do that kind of work before, nor would have again for many years afterwards. But it was what he made of his opportunities that counted. And where Marais's luck led him was another matter. Marais was born to a traditional Afrikaner family in the Boer Republic of the Transvaal in 1872. He had a rather strange schooling: the only teacher available was a Church of England missionary who could not or would not speak a word of Marais's native Afrikaans -- known as "kitchen Dutch" in the snooty British colony of the Cape, where it was the patois of the mixed-race Cape Coloured servant-class. So Marais learnt English. In 1890, at the age of 18, he took his first job, as a journalist for the newspaper Land en Volk (Country and People) in Pretoria, the capital. A year later he was the editor, and by the time he was 20 he owned the newspaper. His acrid comments as a parliamentary reporter at the Volksraad (People's Council) saw the entire Council vote to ban him from the press gallery. Later he was charged with high treason for opposing the president, Paul Kruger, but he was acquitted by the Supreme Court. In 1894 came a severe blow that undoubtedly changed his life. Aged only 22, he married a young woman from Natal, but she died only a year later after their son was born. He never married again. Soon afterwards he gave up journalism, left Pretoria and went to London to study law. He qualified and was admitted to the bar at the Inner Temple. He studied medicine at the same time but in 1899, before he could qualify, the Boer War broke out, and Marais was put on parole as an enemy alien. The British Redcoats were no match for the fast-moving Boer commandos -- 200 years of skirmishes and mutual cattle raiding with the Black tribes had made the tough farmers masters of guerrilla tactics. The British, lacking skill, tried sheer weight of numbers instead -- in the end 450,000 of Britain's cream were pitted against only 80,000 Boer fighters. That didn't work either. Britain's Lord Kitchener finally "solved" the problem. The British cordoned off the land, burned the Boers' farms and herded their women, children and old people into concentration camps, where more than 20,000 died of disease and malnutrition. In London, Marais was distraught. He escaped from Britain and was soon in Central Africa heading towards the Limpopo River with supplies of munitions and medicines to aid his countrymen. But before he got there the Boer generals surrendered and the war ended -- and Marais caught malaria and landed up in hospital in Delagoa Bay (Mozambique). As with the morphine, he never shook off the malaria, it recurred throughout his life. The war left him shattered. He wrote later: "The most enduring result was that it made me far more bitter than men who took part in the war at a more advanced age and who had had less to do with the English before the war. It was for purely sentimental reasons that I refused to write in any language but Afrikaans, notwithstanding the fact that I am far more fluent and more at ease in English." He did however write several learned papers in English, but for the most part he'd doomed himself and his work to the confines of an obscure language with no influence in the world of affairs, and it was to prove his undoing. In 1904 Marais returned to Pretoria, but, shunning human society, he soon left for the Waterberg, an isolated range of mountains in the Northern Transvaal, where he and a friend lived for the next three years. This was part of the depopulated farming country Kitchener had cleared, nobody had lived there for years. Marais's only neighbours were a large troop of wild chacma baboons, which in the meantime had all but forgotten that man is something for a baboon to fear. Years later he wrote in a letter: "No other worker in the field ever had the opportunities I had of studying primates under perfectly natural conditions. In other countries you are lucky if you catch a glimpse of the same troop twice in a day. I lived among a troop of wild baboons for three years. I followed them on their daily excursions; slept among them; fed them night and morning on mealies; learned to know each one individually; taught them to trust and to love me -- and also to hate me so vehemently that my life was several times in danger. So uncertain was their affection that I had always to go armed with a Mauser automatic under the left armpit like the American gangster! "But I learned the innermost secrets of their lives. You will be surprised to learn of the dim and remote regions of the mind into which it led me. I think I discovered the real place in nature of the hypnotic condition in the lower animals and men. I have an entirely new explanation of the so-called subconscious mind and the reason for its survival in man. I think that I can prove that Freud's entire conception is based on a fabric of fallacy. No man can ever attain to anywhere near a true conception of the subconscious in man who does not know the primates under natural conditions." But the Boer farmers began drifting back to the land and their ruined farms, and farmers and baboons have always been deadly enemies -- there is no raider of farm crops to equal a baboon. With the farmers came their guns, and an end to any trust the baboons had developed for Marais. His work now impossible, he moved back to Pretoria to work as an advocate and a journalist, and despite recurrent bouts of "bad health", he continued his scientific research at every opportunity. His work on termites led him to a series of stunning discoveries. He developed a fresh and radically different view of how a termite colony works, and indeed of what a termite colony is. This was far in advance of any contemporary work. In 1923 he began writing a series of popular articles on termites for the Afrikaans press and in 1925 he published a major article summing up his work in the Afrikaans magazine Die Huisgenoot. Few people spoke Afrikaans then, as now, but it's quite similar to the Dutch it stemmed from and any Dutchman or Fleming can read it without difficulty. Maurice Maeterlinck was a leading literary figure of the time. In 1911 he won the Nobel Prize for literature following the success of his play The Bluebird. In 1901 he had written The Life of the Bee, a mixture of natural history and philosophy, but he was a dramatist and a poet, not a scientist. He was also a Fleming. In 1926, one year after Die Huisgenoot published Marais's article, Maeterlinck stole Marais's work and published it under his own name, without acknowledgement, in a book titled The Life of the White Ant, first published in French and soon afterwards in English and several other languages. "You must understand that it was a theory which was not only new to science but which no man born of woman could have arrived at without a knowledge of all the facts on which it was based; and these Maeterlinck quite obviously did not possess. He even committed the faux pas of taking certain Latin scientific words invented by me to be current and generally accepted Latin terms. "The publishers in South Africa started crying to high heaven and endeavoured to induce me to take legal action in Europe, a step for which I possessed neither the means nor inclination. The press in South Africa, however, quite valorously waved the cudgels in my behalf. The Johannesburg Star [South Africa's biggest English-speaking daily newspaper] published plagiarized portions which left nothing to the imagination of readers. The Afrikaans publishers of the original articles communicated the facts to one of our ambassadorial representatives in Europe and suggested that Maeterlinck be approached. Whether or not this was done, I never ascertained. In any case, Maeterlinck, like other great ones on Olympus, maintained a mighty and dignified silence." The 1927 files at The Star to which Marais referred were checked and confirmed by American author Robert Ardrey 40 years later. "Maeterlinck's guilt is clear," Ardrey wrote. It is easily confirmed by a comparison of the two books. Marais's point is indisputable: his picture of the termitary is startlingly original, it could not possibly have been hypothesised or inferred without a great deal of original research, at the very least -- and yet there it is in Maeterlinck's book. Though Marais made light of the issue in his letters of later years, he never regained the clear focus and command that marked his earlier scientific investigations before Maeterlinck committed his plagiarism. It was a bitter blow for Marais, the last of many. "I find no record of scientific accomplishment after 1927," Ardrey wrote. Life went on for Marais, after a fashion. He wasn't entirely embittered, still retaining his famed charm, especially with children, which tells much -- he spent much of his time with children, wreathing them in magic with his wonderful tales. Between continuing bouts of "ailing health", whether due to morphine or malaria, he worked as an advocate, he wrote articles and stories. But what should have been written and bequeathed to the world wasn't done. The Soul of the White Ant was published in Afrikaans, and then later in English, but the more scientific work from his notes and studies that should have amplified it was not forthcoming. The planned companion volume on the psyche of the baboon, The Soul of the Ape, was never finished. Several excerpts were published in Afrikaans, but the book itself didn't appear. A further work summing up and integrating his findings and conclusions in the two branches of his investigations should have followed, but it didn't. In 1936, Eugène Marais killed himself with a shotgun on a farm near Pretoria. Soon afterwards Dr de Kok wrote to Marais's son asking about his father's papers, and especially about the manuscript of the unfinished and unpublished The Soul of the Ape, which Marais had discussed with her a few months before his death. The son responded: "There is no sign of a manuscript and no notes." In 1968, 32 years later, without explanation, the son handed the unfinished manuscript of The Soul of the Ape to Marais's old publishers in Cape Town, handwritten in Marais's hand, in English, and, at last, it was published. It is a flawed work, and Marais knew it, as his letters make clear. Maybe before his death he told his son that, or maybe the son decided it for himself. One flaw is that it's definitely not finished -- suddenly it just stops. There's also an unevenness to it, and in the sense that informs it. The Marais of The Soul of the White Ant is a charming and engaging fellow, a thoroughly good companion, but in The Soul of the Ape another Marais seems occasionally to intrude, perhaps the "sombre side" his friends sometimes alluded to, that his children friends never saw in their Pied Piper. The book is still highly readable nonetheless. Marais's work and his findings shine through -- and profound they are, as pertinent today as they were then, or more so. And the more welcome for having been thought lost forever. But there should have been more, the work should have been finished, it could and should have been rounded off with so much more of the fruits of Marais's copious fieldwork and his extraordinarily clear insight. Maybe it had to be approached with a sense of joy in nature that Marais could no longer muster. If so, much of the blame for that is to be laid at the door of Maurice Maeterlinck, plagiarist, who left nothing remotely comparable in his own work by way of compensation. Yet, the crushing note of a shotgun blast fails to set a judgment on the tortured life of Eugène Marais. That he could rise above his sufferings and misfortunes to leave us these two gems of his work says far more about the human spirit that he devoted his life to studying, and which is their true subject.